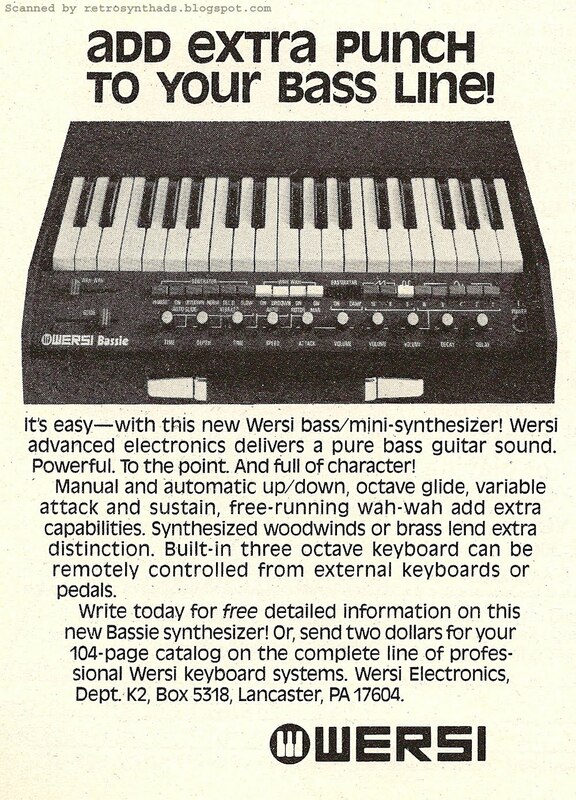 Wersi Bassie (bass/mini synthesizer) advertisement from page 48 of Contemporary Keyboard Magazine March 1978. This was the second Wersi Bassie advertisement to appear in CK. In my blog post last week about the first Bassie ad, I mistakenly said it ran from September 1977 to May 1978. In fact, this second 1/4-page advertisement replaced the first in March 1978 and ran for three issues. As mentioned in that first blog post, the photo used in both the first and second ad has 'Bassie' next to the logo (front left side), but I still have yet to find a photo of a real-life Bassie with the English name on it. All the photos I've come across have the German version on the name. Wersi decided to take a bit of a different direction with this ad - especially with the top tag-line. It is an odd one with a mixture of upper- and lower-case letters. I'm sure the mix was meant to play into the 'punch' aspect of the tag-line, but, because of the font used, it really just looks wonky. Plus, there are some letters that you really don't known whether they are supposed to be upper- or lower-case. "aDD exTra PuncH To Your Bass Line"
"aDD eXTra PunCH TO YOur BaSS LIne!" ... but, I do know that using a different font might have helped make the point better. Plus, I can see why the a's would be lower-case to match the 'a' in the 'Bassie' name, but like I'm prone to do, I started to fixate on that tagline. Maybe there was a coded message in there... maybe the capital letters spelled out something? I never could find anything - let me know if you do. The ad-copy also slightly changed directions. They still focused on the 'pure bass guitar sound', but tossed out the ' full range of flute stops'. It's like Wersi was making an extra effort to distance it even further from any association with an organ keyboard. Smart move in my opinion. I've questioned the effectiveness of putting small ads in the back-half of CK, especially if the ad was only appearing for a limited time. Wersi obviously thought it was cost-effective to regularly run smaller sized ads, as did many other companies including Aries (label), Steiner-Parker (label), EML (label) and Paia. But what about those even smaller ads - the ones that usually appeared three-in-a-row at the bottom of the page in the last-half of CK - each ad measuring about 1/15th of a page in size? They were often keyboard dealers, small manufacturers, and schools advertising courses in piano tuning and music theory. Some of them appeared in CK for what seemed like months, or even years at a time. In the March 1978 issue, there were two such rows at the bottom of page 56 and 58 (there were other small single ads scattered throughout the mag as well). Thinking back now, I remember some of these smaller ads quite well - while others I had totally forgotten about. Some really used the small space well, while others just tried to splash as much text as possible into the cramped space provided. As seen in the images above, using logos was probably the best bet to grab the eye of a reader (ARP!). So, maybe some of these small ads, run enough times, could provide enough exposure to stick in the minds of readers. And, you have to give CK credit for providing smaller companies with even smaller marketing budgets a platform to advertise on a national level. I wonder what it cost to run one of these small ads? I think I need to take a closer look at some of these smaller ads in the near future. I'll be sure to report any conclusions.